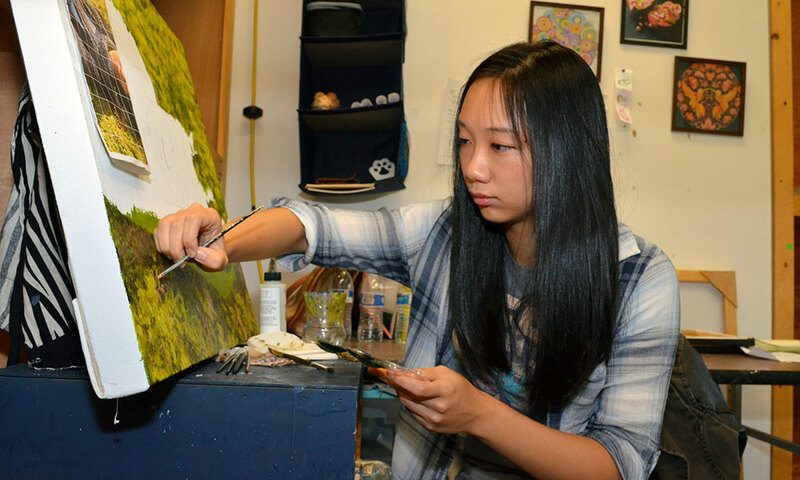 University of Rochester senior Ruoxue (Astra) Zhang, a major in electrical and computer engineering at the University of Rochester, is pursuing her passion for art with a second major in studio art. 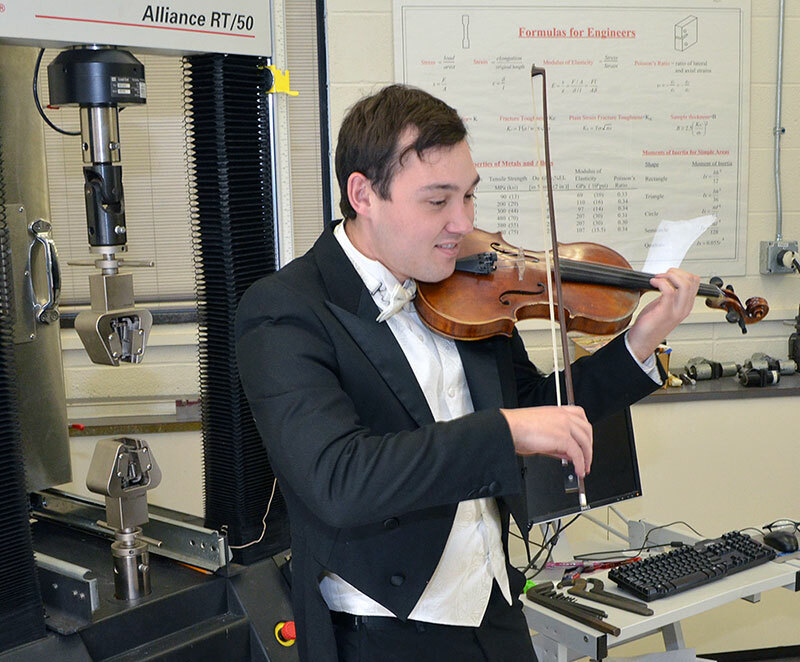 Senior Ivan Suminski, a mechanical engineering major at Rochester, is pursuing his passion for the violin at one of the world’s premier schools of music. Thanks to the Dual Degree at Eastman program, he’ll earn a degree from Rochester’s main academic unit, Arts, Sciences & Engineering, as well as a degree in violin performance from the Eastman School of Music. The two distinct programs of study, he says, have opened up multiple career options, including his “absolute dream job” of performing with a string quartet. Zhang and Suminski are recipients of this year’s Wells Award, given annually to the two students in the Hajim School of Engineering and Applied Sciences with minors or second majors in the humanities who had the best overall GPAs at the end of the junior year. The award reflects the value that the Hajim School, and the University as a whole, places on giving its students a well-rounded, interdisciplinary education. “Although engineers are problem solvers, as problems become larger and more complex, it’s important that our students are skilled at communicating with each other, their customers, and with other stakeholders in order to effectively solve these problems,” says Lisa Norwood, the school’s assistant dean for undergraduate studies. For example, many artists now use digital platforms to express themselves. She notes that animation involves varying degrees of computation skill. In computer engineering, moreover, students often work on practical projects in which the visual elements of design are a factor—“especially in human-computer interaction,” Zhang adds. Ultimately, Zhang says, she would like to start her own company creating portable, user-friendly devices. Suminski is also discovering ways in which his pursuits complement each other. For example, as both a violinist and a budding engineering, he is intrigued with the research that Jong Hoon Nam, an associate professor of mechanical engineering, is doing on the biophysics of inner-ear sensory cells. And last summer, Suminski had an internship with a company that produces musical accessories—including violin strings. He’s considering a range of options after graduation, including graduate programs in music performance, or applying to continue in mechanical engineering as a graduate student in Nam’s lab. Remarkably, Zhang and Suminski have both found time to pursue extracurricular interests as well. Zhang is a peer advisor and a member of the Equestrian Club. Suminski, active with the Catholic Newman Community, organized a service trip to Frenchville, Pennsylvania, a poor, rural community in Central Appalachia, over last spring break. How do they manage their time? Both say they get by on a few hours of sleep.